The club hosted another successful VIP & Media Ride this year with 76 snowmobiles hitting the trails at -25C! Sledders of all skill levels bundled up and braved a chilly afternoon of snowmobiling. We proudly showed off our trail system, the Groat Creek Canyon Look-Out and the newly re-built Summit Cabin. 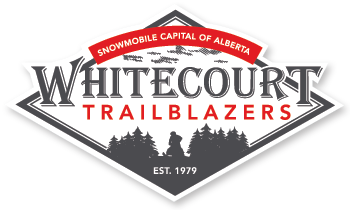 The Annual VIP & Media Ride features MLA’s, MP’s, Mayors, Municipal Councillors and other dignataries, TV, Radio, and Newspaper media, as well as members of the Whitecourt Trailblazers Snowmobile Club and Executive Members of the ASA. The Manweiler Trail for the first couple miles south of highway 43 from the Chickadee burner is closed due to culvert issues, creek issues and several big trees down around the new cut block. Please cross south at intersection and follow road to the south to connect to trail. Trails are in good condition as Trailblazers were out cutting trees again yesterday. Triangle trail to Virginia Hills road and all trails north of Athabasca river have been cleaned. Thanks to Trail bosses Dave and Chet and their crews. There are some sore backs today. If anyone finds the starter, phone booster, tool box or aluminum side panels from the vandalized groomer, please let me know. Too bad the volunteers put in all this work and someone wrecks stuff. Thanks to those who support organized snowmobiling by purchasing trail passes. The strong winds last week put a lot of trees on the trails. Yesterday, Trail boss Chet lead a crew that cleaned the Goodwin lake trail, Groat Creek Canyon trail, and Summit trail to the Summit shelter. A lot of cutting and throwing. Please report any really big trees on other parts of the trail system. Use caution until entire trail system can be cleaned again. The groomers have been busy. Grooming took place near Letter ‘O’ on the Golden Triangle Trail recently. The warm weather this week melted a lot of snow but some fresh snow this morning will keep the trails in good condition. Groomers will continue as conditions allow. Word is that logging will begin east of the Virginia Hills road so use caution.